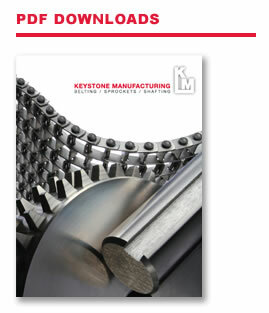 - Keystone stocks stainless square shafting. - Full length bars and cut-to-length bars available. - We can turn down the ends of square shafts to fit in your bearing or add a keyway for gears. Square Shafts: 1-15/16" is the largest square shaft we can turn. All other specs. remain the same. Lathe cut ends = +/- .010"
Turned Work: Keystone can perform turning work such as turned down ends and ring grooves up to 16" from the end of the shaft. Dia Tolerance: All Shafting made to a bearing fit. Any other corner radius available at no additional charge. We break all sharp corners and put a 45 degree chamfer on all bar and turned ends. Ring Grooves Ring Grooves can be only added within 16" of the shaft ends. Keyways: All keyways to be ANSI standard. Alignment of interupted keyways is not guaranteed. Keyway lengths are measured from the center of the end mill to the center of the end mill. This is the useable portion of the keyway assuming square end keystock. Keyways in turned down ends, will end 1/8" from the end of the turned portion. This allows 1/16" for the corner radius plus 1/16" of safety, plus 1/2" the keyway width for the end mill radius. Keystone can vary from these standards only if the variation is included with the quotation. Items and terms shown on P.O. but not included in quotation will be considered extraneous and not be honored.